When: Sunday, May 5; Open schooling on Saturday May 4, 9 a.m. to 6 p.m. 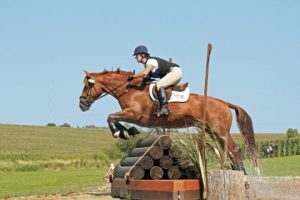 Entries are open for Eventer Derby. Closing date is Tuesday April 23. Tentative Schedule: Open Schooling 9 a.m. to 6 p.m. Saturday. Sunday dressage starts at 8 a.m., derby tentative start at 10:00. Open/Close Dates: Entries are open. Closing date is Tuesday April 23.No pre-registration required for open schooling. Ride times: will be posted via link from this website’s homepage on Tuesday April 30. Dress: Neat casual. Breeches, belt, boots or paddock boots and half chaps, shirt with a collar. Must have ASTM-approved helmet and hard-soled shoes whenever mounted. Must have safety vest for xc schooling and jumping phase of competition. Fees: Show entry, including Saturday night stabling, show fees and saturday xc school is $175. If hauling in on Sunday and working out of your trailer for the show only, entry is $100. Additional dressage test(s): $25 per test and will be scheduled after ODE tests. A refundable $25 stall strip fee is required. Stall deposit checks will be shredded or PayPal stall strip deposits returned if stalls are stripped. Draw checks to CCCHT. Mail to Camie Stockhausen, Attn: Eventer Derby, 57560 Highway 210, Cambridge, IA, 50046-8583 PayPal to Catalpacorner@gmail.com in two payments: $181 ($6 convenience fee); and $25. Do not use PayPal friends and family option. Your entry will be complete when you 1) complete the below online entry form; 2) send payment for entry and separate $25 stall deposit check or PayPal payments; and 3) and send signed and dated Catalpa Corner release form. Signature of a USEA waiver will be required, and those forms will be available at the park. If you pay by PayPal, you may present the two waivers to the show office to receive your number. Show will be held rain or shine. If cancellation is required due to footing concerns, refunds less show set up expenses will be granted. Riders who are not competing in the show may school on Saturday for a $70 fee paid upon entry to the park. Stabling preference will be granted to those entered in the show. Stabling for those not entered in the show, if space allows, is $25. Friday night stabling is also available for an additional $25. Saturday’s schooling will open at 9 a.m. and close at 6 p.m.
On Sunday, additional dressage tests will be scheduled after all ODE entrants have completed their dressage tests. Entries are considered complete only when electronic entry (below) is submitted, and signed Catalpa waiver, USEA waiver, entry fee, refundable stall deposit and any other requested information is received by the secretary. Withdrawals or changes to entry accepted by email only before 9 p.m. on the closing date. Withdrawal refunds will be less a $25 office fee. No changes to entries after closing date (Tuesday 4/23), except in the case of veterinary or medical emergency. Post entries accepted with $25 late fee and if space is available. Stallion entry by permission of organizer only – additional tack stall required. Camping: Available on site. $30 for the weekend. Sign up on registration form. Electronic Entry Form is accepting responses below. Use the scroll bar on the right to complete form.